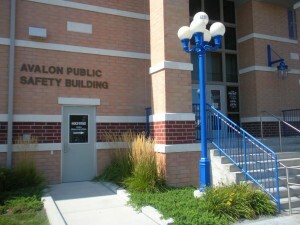 About The Avalon PD – AVALON POLICE DEPARTMENT N.J. The Borough of Avalon was officially incorporated on April 18, 1892. Thomas Bray was the first elected mayor. On April 24, 1957, Mayor Greenan signed Ordinance No. 293: “An ordinance providing for the creation, establishment, maintenance, regulation and control of the police department for the Borough of Avalon, Cape May County, New Jersey”. Section 1: There shall be and hereby is established a permanent police department for the Borough of Avalon, Cape May County, New Jersey. Section 2: The head of the police department shall be the Director of Public Safety of the Board of Commissioners of the Borough of Avalon. b) Shall make, administer and enforce rules and regulations for the control, disposition and discipline of the department and of its officers and employees. In 1957, the entire Avalon Police Department budget was $44,700 ($36,700 for salaries, $8,000 in operating expenses). Officer Henry Armstrong was appointed as the first Chief of Police. The current Chief, Chief Jeffrey Christopher, is the eigth Chief of Police for the Avalon Police Department. The Avalon Police Department currently employs (21) sworn officers, (5) dispatchers (*3 additional relief dispatchers), and (3) non-sworn employees. We currently have (1) Chief, (1) Captain, (1) Administrative Sergeant, (4) Patrol Sergeants, (1) Detective Sergeant, (1) Detective, and (12) Patrolman. As a summer resort, The Avalon Police Department employs up to (16) Class II Special Law Enforcement Officers each year. The Class II Officers also supplement the patrol squads when needed. Several Class I Special Law Enforcement Officers are also hired during the summer season. These Class I Officers are assigned to enforce parking regulations. The Avalon Police Department utilizes several patrol cars as well as (2) marked 4-wheel drive sport utility vehicles which are capable of patrolling the beach, and an unmarked 4-wheel drive sport utility vehicle for the Detective Division. The Avalon Police Department also consists of a seasonal bike patrol unit which is supervised by a full-time patrolman. Most of the Class II officers are assigned to this unit. In addition to the seasonal bike patrol unit, the Avalon Police Department has a Marine Unit which consists of (2) police boats. These boats are used to patrol the waterways in our jurisdiction.